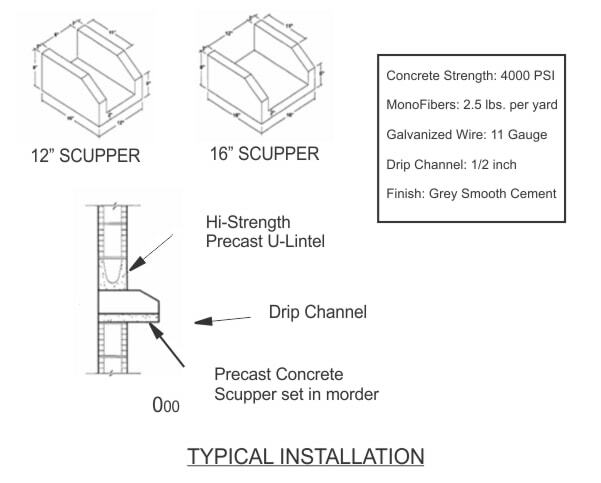 In Coral Springs Precast Concrete Scuppers provide a reliable method to protect your foundation and landscaping by channeling water away from the structure, preventing rainwater damage. Contractors, architects, engineers, and designers have trusted Atlantic Coast Precast for their construction and restoration projects. Also referred to as downspout splash guards or splash blocks, these products are a cost effective method to provide rainwater management. In Coral Springs, precast concrete scuppers are a durable way to protect your home or business. The process begins with a cast of your design, where molds allow flexibility to add or remove elements to change the size and shape quickly and easily. Using your drawings, samples, or specifications, our experienced team at Atlantic Coast Precast has been creating custom concrete products for contractors, architects, engineers, and designers since 1965. Our team works with you to discuss your needs for your project in Coral Springs, with precast concrete scuppers and will suggest options for both functionality and budget. Providing cost effective solutions and customizable installations, precast concrete is a building material proven in its strength and ability to perform year after year. With its inherent ability to resist creep and shrinkage, it strengthens over time. Give us a call today for more information.